The Freaky loves this bizarre photo of a man stuck under a building. But don’t worry the man’s not hurt its just a weird piece of street art. 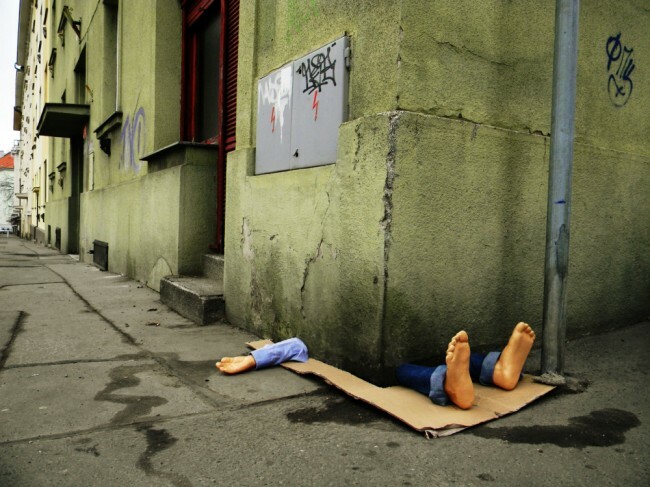 Created by Italian artist Fra Biancoshock this is a piece of installation art that Fra calls “urban intervention” and can be found in Prague in the Czech Republic, where it is causing quite a stir. The art work consists of an arm and two legs sticking out of a wall to look like a man taroped under the building. ‘My “experiences” are not showcases to promote my activities, they do not require any description,’ Biancoshock said. They are simply opportunities to communicate and provoke reactions from common people.